There’s a good chance you have at least one universal remote in your home. While it may be able to work across a few different devices, we don’t really bother with figuring out what codes to enter to make everything work together. This usually results in 4 or more remotes hanging out on the living room table. Invariably, one of them goes missing and it’s always the one that changes the channel. Instead of wishing you had entered the codes (which even when you do find the remote you know you’ll never actually do it), wouldn’t it be better to get a universal remote that actually does its job? The NEEO is a true to term universal remote that can connect to tens of thousands of devices as soon as you take it out of the box. There are two aspects to this remote, one being the brain and the other being an actual remote. The brain is what controls all of your gadgets and gizmos, while the remote is your interface. 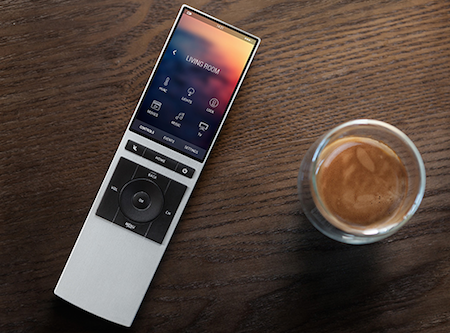 The remote has a 291 ppi display, a few standard buttons for general media, and hand recognition that will be able to tell if it’s your palm holding it and immediately bring up your favorite playlists, movies, and more. The remote runs off of rechargeable batteries that won’t need to be plugged in for months at a time, and should you happen to lose this in the couch cushions you can activate an alarm through your phone which will make it chirp until located. This will cost you anywhere from $219-249, and plays nicely with iOS and Android phones. If you’d rather only have the brain you can use your smartphone as the remote and the cost will be reduced to $148.